The new indie comic ‘ARTHUR SHILLING: Paranormal Adventurer & Gentleman Engineer’ marries the worlds of Steampunk and the Paranormal into a series of chill adventures. Each issue contains both a comic book story and an illustrated story. 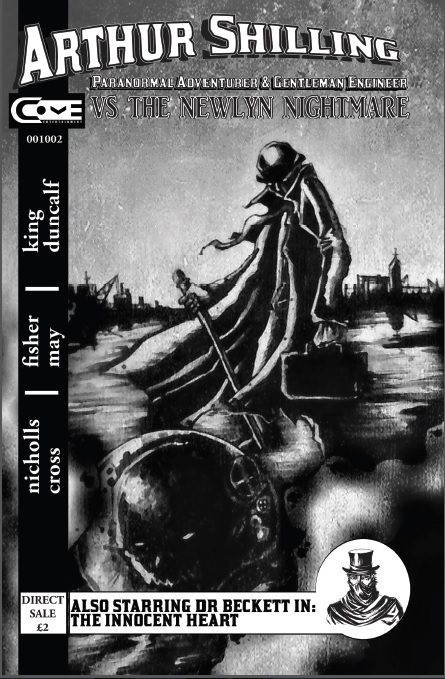 Issue 1 ‘vs The Newlyn Nightmare’ sees Arthur on the trail of a heart stealing killer in the industrial fishing village of Newlyn, in Cornwall. Leading to a mighty showdown. In ‘The Innocent Heat’ Dr Beckett tackles the possession of a young girl who is the heir to a mining fortune.